In our desire to have a stadium that held onto the traditions of the old and set the bar for all future stadiums, Walter P Moore excelled. Their can-do attitude led us to the finest football stadium in the country. 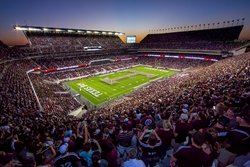 The American Council of Engineering Companies of Texas (ACEC Texas) has named the redeveloped Kyle Field at Texas A&M University in College Station, Texas the Eminent Conceptor in its 2016 Engineering Excellence Awards (EEA). The EEA competition recognizes engineering and land surveying firms for projects that excel in five key evaluation criteria: 1) an innovative application of new or existing techniques, 2) future value to the engineering profession, 3) social and economic considerations, 4) complexity, and 5) meeting or exceeding owner/client needs. The Eminent Conceptor is awarded to the highest-scoring submission overall (regardless of entry category) in the competition. Awards were presented March 21, 2016 at the 2016 ACEC Texas Annual Meeting in San Antonio. First (gold) and second (silver) place winners were awarded in each entry category — 9 Gold Medals and 6 Silver Medals this year. The Kyle Field Redevelopment project also earned a Gold Medal in the Structural Systems category. All winners. Kyle Field is the most extensive redevelopment of a collegiate athletic facility in history, redefining what is possible in sports facility enhancement and serving as the benchmark for future university stadium projects nationwide. Steeped in traditions that span generations, Kyle Field is a source of pride for thousands of Aggies across the country and a critical economic driver for the surrounding community. Rather than demolish their aging giant to build a new stadium on another site, Texas A&M preserved their proud history with a more sustainable (and technically challenging) approach by commissioning an unprecedented redesign of their home field. Construction was completed in only two off-seasons, allowing the Aggies to maintain their impressive home field advantage throughout the project. One of the most complex sports projects ever attempted and with one of the most complicated seating bowl structures in the nation, Kyle Field presented the massive design challenges of a significant new sports stadium with the intricate and often unforeseen difficulties of a major renovation. Walter P Moore demonstrated engineering excellence and ingenuity at a record pace, using an integrated engineering approach. The engineering work is largely visible to the public with vast column-free spaces, soaring cantilevers, and towering scoreboards. Improvements to fan experience for safety, circulation, and comfort include structural repairs throughout, widened concourses, additional restrooms and concessions, and “cool zones” designed to combat the Texas heat. Walter P Moore served as lead structural engineer with primary responsibility for developing and implementing design solutions; Rogers Moore (now Henderson Rogers) served as associate structural engineer; Populous served as architect of record; Manhattan Construction was construction manager. ACEC Texas is the business association of Texas engineering firms, committed to advancing the private practice of consulting engineering, enhancing markets for private engineering services, educating the public on the importance of infrastructure investment, and promoting sound business practices within the industry and its client base. Walter P Moore is an international company of engineers, innovators, and creative people who solve some of the world’s most complex structural and infrastructural challenges. Providing structural, diagnostics, civil, traffic, parking, and transportation engineering services, they design solutions that are cost- and resource-efficient, forward-thinking, and help support and shape communities worldwide. Founded in 1931 and headquartered in Houston, Texas, Walter P Moore‘s 570+ professionals work across 15 U.S. offices and five international locations. Editor’s Note: There is no period after the ‘P’ in Walter P Moore.